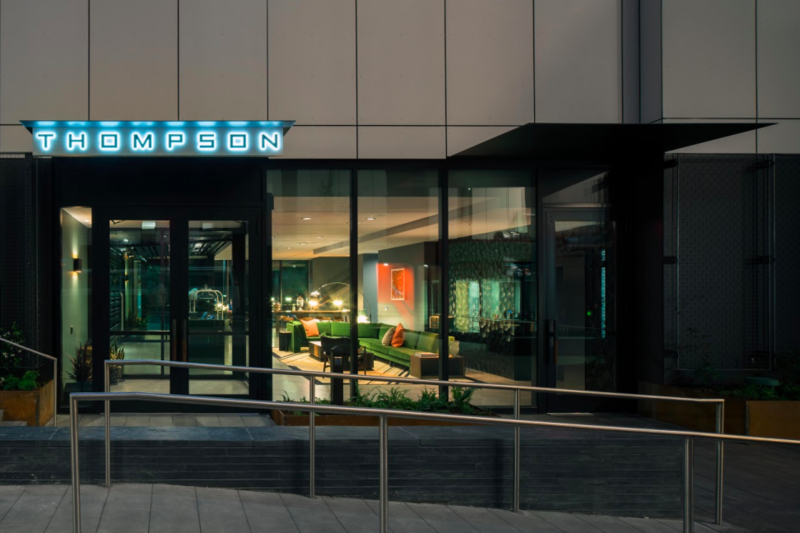 Thompson Seattle is situated adjacent to the historic Pike Place Market District and is neighbored by a range of buildings that represent Seattle’s rich history. 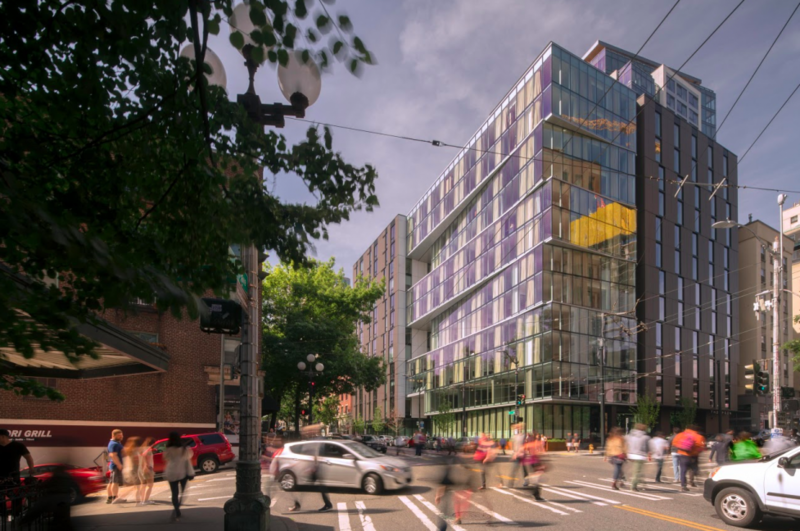 For renowned architect Tom Kundig (owner and principal of Olson Kundig, the award-winning Seattle-based design practice and the firm responsible for the hotel’s architectural design) this presented an opportunity to create a gateway space at an important intersection of the city. 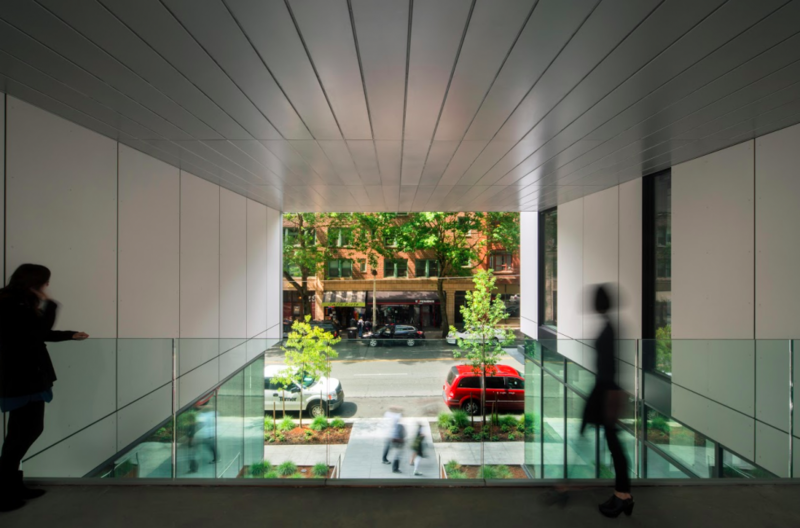 “The building is composed of two primary elements that break the expression of the structure: a focal point “glass lantern” with geometric shifts that physically mimic the street grid alignment; and the adjoining frame of solid facades that provides a visual counterpoint,” says Kundig, who also envisaged an interior courtyard to offer contemplative connection to nature in the middle of bustling downtown. 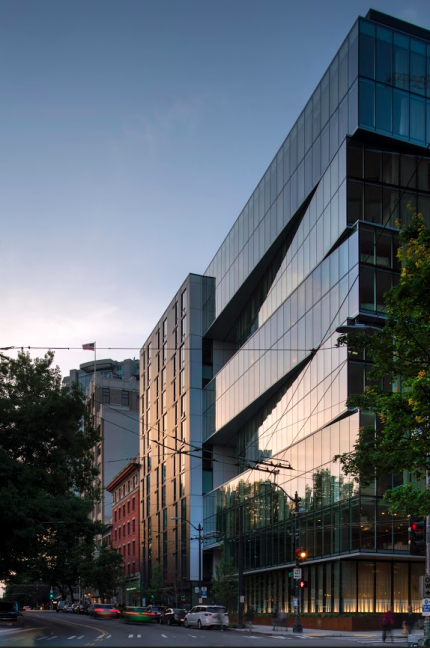 Here, Kundig reveals how the spirit of Washington State informs his work, why sustainability informs all of his projects, and which buildings inspire him most. You’ve said that architecture is the intersection between the rational and the poetic. How does Thompson Seattle reflect this idea? Raised in a tradition of art fabrication, I witnessed the potential of inventiveness and the skill of shaping natural materials as an exploration of an idea: the magic of finding the intersection of the rational and poetic, and the tension between the idea and completion. The complex program of this project allowed us to explore the urban built environment under all conditions: from private to public; interior to exterior; and rational to poetic. This is clearly evident in the contrast between the slightly poetic glass lantern element and the building’s rational street facing structure, which is an integrally colored cement panel façade system that fits with the surrounding historic brick buildings. Finishes within the courtyard are light and white (again, quite rational) to create more reflectivity. What is your vision for how locals and visitors will move through and negotiate the space? Drawing from its surrounding context the building features an interior courtyard that offers a quiet, protected area as an entry point to the hotel. The Pike Place Market District has a pattern of existing pedestrian circulation through courtyards and alleys that evoke a sense of wander and exploration. 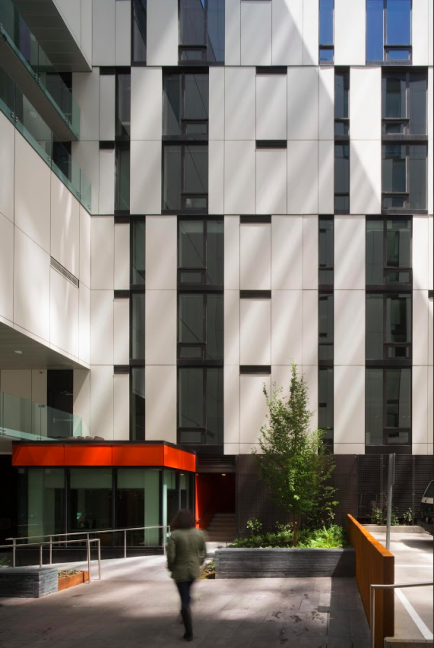 The Thompson Seattle courtyard endeavors to connect the building to these pedestrian pathways in addition to serving to bring in natural light, air, and ventilation. Punching openings higher up in the structure also allows people to see into the building, invoking a sense of visual accessibility. 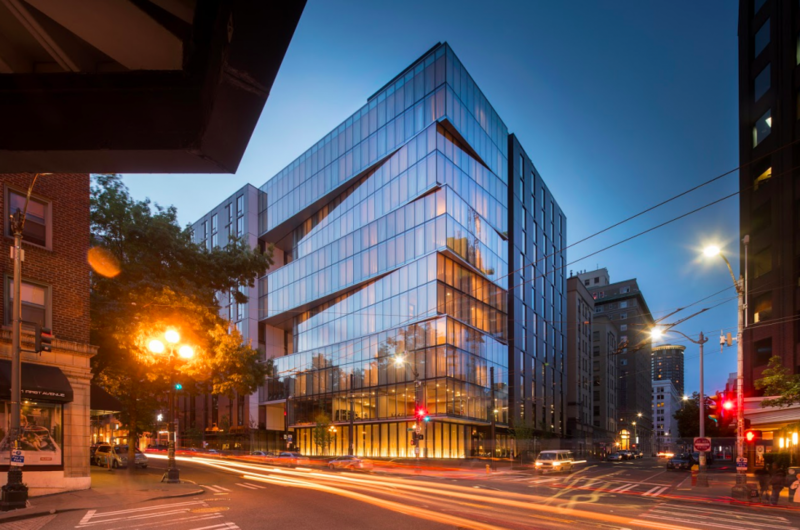 Conceptually, the building is denoted by both introverted and extroverted spaces, while the iconic glass lantern is symbolic of the hotel’s relationship with Seattle, the Pacific Rim, and wider world. It serves as an inviting and luminous entity. How would you describe the spirit of Washington State? How has living in this context influenced your work? I grew up in Eastern Washington State: a landscape that is large and humbling. Big landscapes influence how you interact in the world. They open up your scope of reality and how you approach architecture based on a larger sense of place. I spent my youth exploring the extremes of the Pacific Northwest–skiing and mountaineering–while experiencing firsthand the heyday of some of our nation’s significant extraction industries, such as the timber industry and mining. I was taken by how humans could shape and move things larger than themselves. There’s a reverence for nature in your work. How does that translate to an urban setting like downtown Seattle? Our work has always been context-driven, whether that context is natural, cultural, or built. Designing for life in an urban setting is largely based on the common human needs of intimacy and extraversion–these needs follow us wherever we go. It matters less whether the project is urban or rural and more about how we, as architects, draw on a specific context to create spaces that feel authentic and human in scale. It’s about how we provide prospect and refuge, no matter the context. I think it is so important that architecture does not compete with its surroundings (whether in the city or out in nature). We need to acknowledge the place of architecture within the larger space. 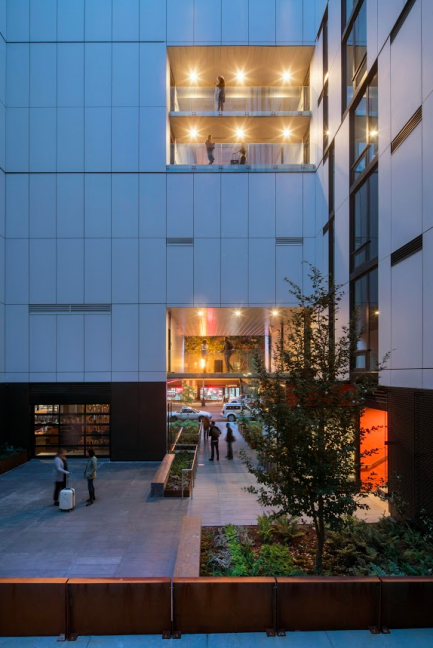 In the case of the Thompson Seattle the location of the site at the axial grid shift presented us the opportunity to create a focal point in the “glass lantern” with geometric grid shifts that mimic the street grid alignment. When did sustainability become a driving factor in your work? 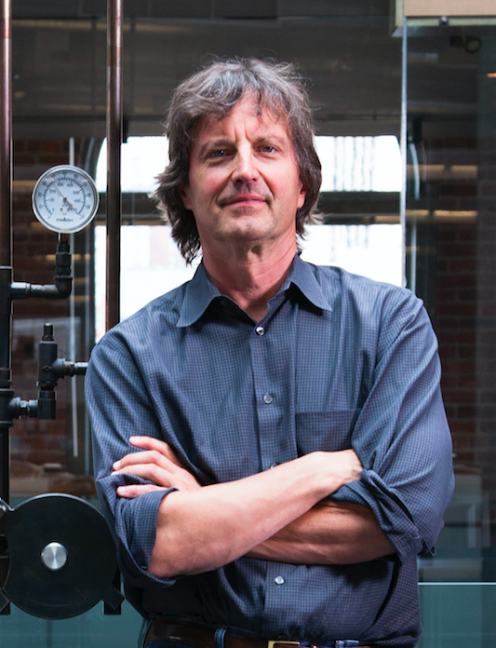 Sustainability has been in the business of architecture for many, many years. It’s not just this recent, reactionary surge to what is clearly becoming a big issue, i.e. the survivability of the earth. What’s changing recently is that there is a better understanding of what sustainability means, because it’s not just technology that’s sustainable but it’s also about how you build smart. These issues are becoming part of all architects thinking–more now than ever before–because there are systems in place that almost force those decisions and there’s a little more sensitivity and understanding of why we make the decisions we make. Can you share three of your favorite go-to spots close to the hotel? For clothing: Jack Straw, which is where I typically go for very special clothing. For women’s, I would suggest Baby & Company. For books: Peter Miller, which I believe is one of the best design book stores in all of America. For drinks: The Virginia Inn, which is a classic tavern in the Seattle area and has been around forever. For Nature: Olympic Sculpture Park is a must. 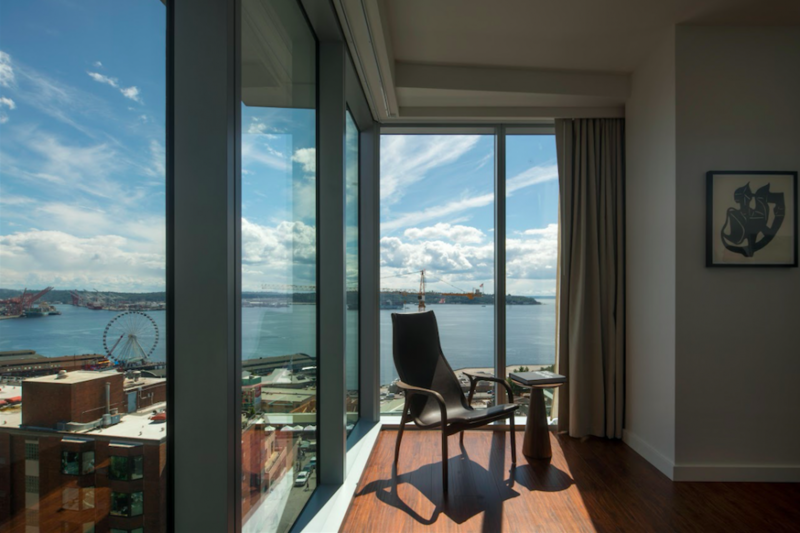 How would you spend your ideal day in Seattle? 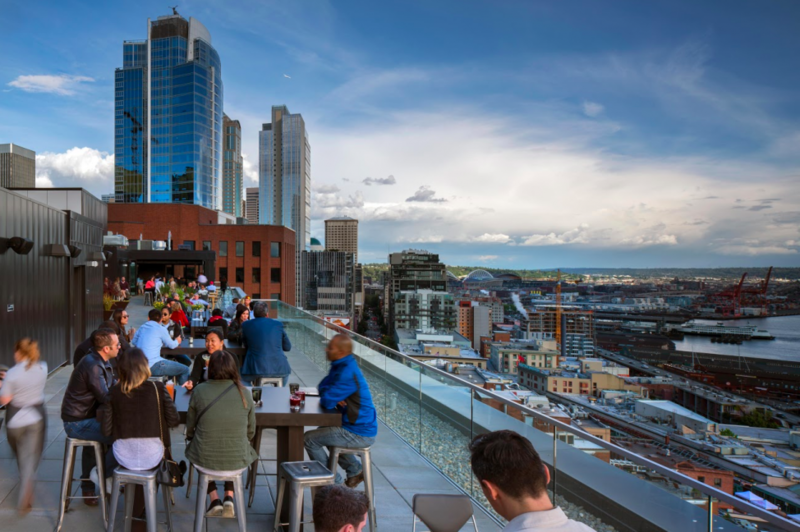 I am a resident of Seattle, so my ideal day would be different than a visitor, but I’m going to answer by sharing what I think would be a good way to spend a day in Seattle as a visitor. I’m also going to imagine this day on foot – not by car. One great thing about Seattle is that it’s a pretty good walking town. I would imagine spending a day walking in a sort of a circle in the Seattle-area. I would start at Pike Place Market for breakfast (at one of the breakfast spots or at the hotel) and then see the market open – breakfast is available from 6am, fresh produce and seafood at 7am and the official market bell is at 9am. You will get to see the merchants bringing in their merchandise–I personally think that’s a really special time and also when the crowds are low. Then I’d walk along the waterfront to the Olympic Sculpture Park at around midday and continue on to see the rest of the waterfront area. Now the waterfront is under construction at the moment, so as an alternative I would walk back towards Pike Place Market after the Olympic Sculpture Park and then walk down First Avenue or one of the other avenues – for example Fifth Avenue for shopping, First Avenue for character – and then work my way to Pioneer Square. I would stop for a coffee at Caffè Umbria in Occidental Park. If there was a game going on at one of the stadiums I’d check that out too. Then finally (if in fact people are still walking!) I would make the circle back up to Pike/Pine Corridor, which is above downtown. It’s a pretty good walk but you can also take the Seattle Streetcar from Occidental Park up to Pike/Pine. The evening is a pretty good time to be in that area and there are some great places for dinner, pubs and music venues. Afterwards, the circle would complete as you return back down to the hotel. Are there any Seattle buildings of note that inspire you? I have about 10 choices, but a few stand out: 1264 Eastlake Ave. E. (former Steinhart, Theriault and Associates’ office building) on Eastlake; the Pike and Virginia building in Pike Place Market; the Chapel of St. Ignatius at Seattle University; the U.S. Plywood Corp. building in Salmon Bay–mostly for the irony, since it was built out of brick, concrete and steel, with the building sign in concrete; The Seattle Public Library designed by OMA + LMN (Rem Koolhaas and Joshua Prince-Ramus – Partner-in-Charge); Experience Music Project (EMP) Museum building designed by Frank O. Gehry; and of course the iconic Space Needle.